Indoor bouldering is a great alternative for Berliners. Still, there is something about the idea to do “the real thing” in the outside world. We made rock climbing in the Elbe Sandstone Highlands our first outdoor climbing experience. 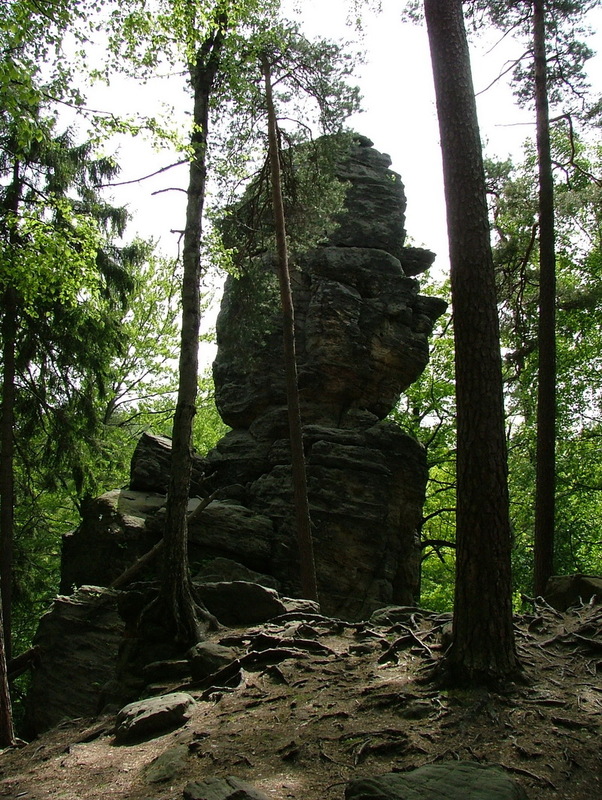 The Elbe Sandstone Highlands are part of a low mountain range at the upper reaches of the Elbe in Saxony and the Czech Republic. The German part is called Saxony Switzerland. 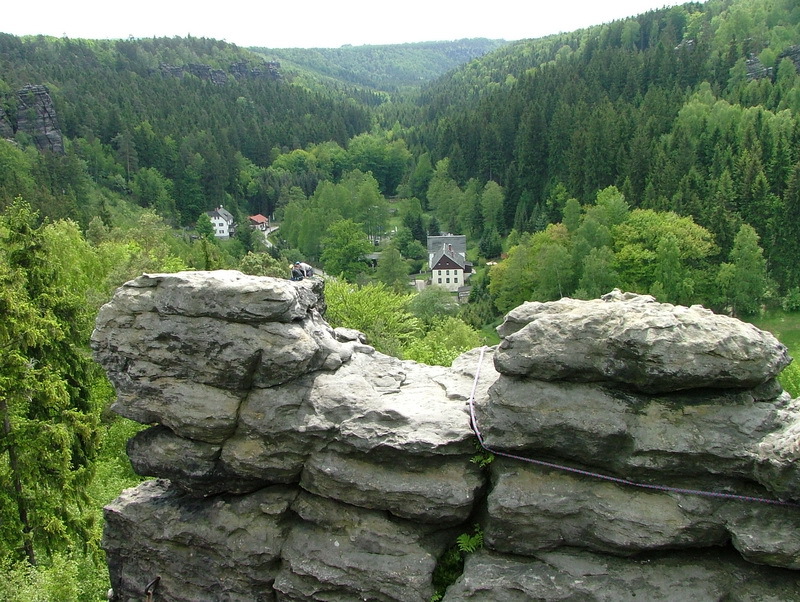 The highest mountain in Saxony Switzerland, the Great Zschirnstein, is 561 meters high. 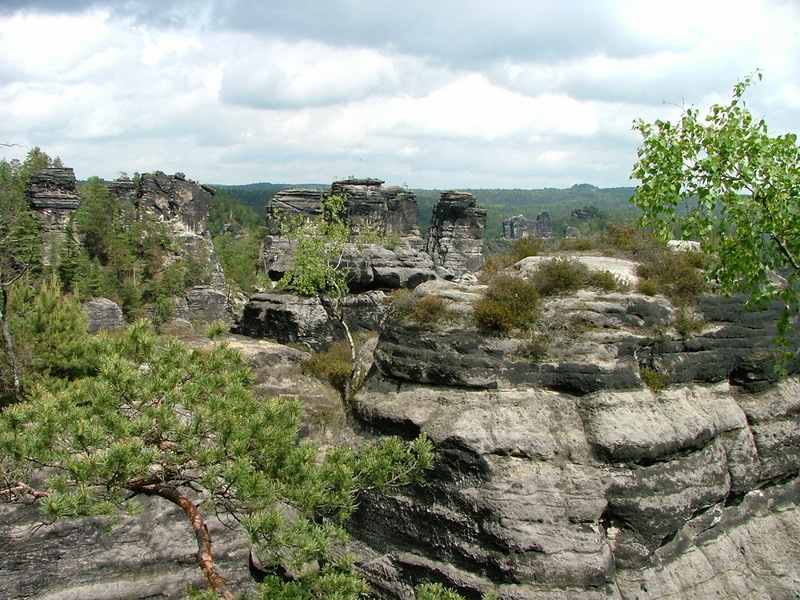 The Elbe Sandstone Highlands are very rugged Rocky Mountains. We were intrigued by the many different textures and shapes – plains, clefts, peaks, Table Mountains and extensive woodlands. We gained a little experience through our indoor climbing in how to secure others and ourselves and we also have a little bit of gear like carabiners, harnesses and shoes. But nonetheless, we did not want to climb all alone on a real rock without the grips and loops that indoor climbing venues provide. Instead, we booked a guide and a beginner’s course. A good call, he picked appropriate routes and adjusted everything to our level of experience. From our meeting point we had to walk through the forest for a little while before we reached the cliff that our instructor had chosen. We swiftly got our gear out and listened to the brief introduction from our guide. To be honest, I was a little surprised by how small the crevices and edges were that we were supposed to use. Sometimes a fingertip was all that we were able to fit on the little ledges. And then we got down to business. Our rock was about ten meters high which is close to the average height of the walls for indoor climbing. But obviously, this rock was missing the convenient ropes dangling down from the top that we were used to for securing ourselves on the wall. Our guide quickly climbed all the way to the top to let a rope down for us. He didn’t even put his shoes on properly, didn’t secure his route even once and took less than two minutes. I am almost certain that my face didn’t look all that intelligent at that point but I had never seen anything like that before. My turn came and I hooked up to the rope for my first steps onto the rock. It was relatively easy at the beginning. I still had enough strength in my fingers and the adrenaline was rushing through my body. Somewhere in the last third of the ascent, however, I couldn’t see anything that remotely reminded me of a proper hold. I got a friendly “can’t you see the edge above you?” from the bottom that was supposed to help. But this edge was a good 15 cm above me and jumping is quite impossible whilst hanging from a rock. “Wait. I’ll help.” from the bottom and our guide got me out of trouble. All of a sudden I was floating in the air and was able to sort out my hands and feet. I reached the top and my breath was taken away. We only climbed up about 10 meters but on the other side of the rock was a ravine 50 meters deep. What a view! We did two more ascends on that day until we only had just about enough energy left to make it back to the car. Our sore legs and hands reminded us of that adventure often over the next few days. A great, exhausting day of rock climbing in the Elbe Sandstone Highlands! I found an exquisite article about Saxony Switzerland and the Elbe Sandstone Highlands on Crappy Radio Stations and Candy Bars . Go and have a look.